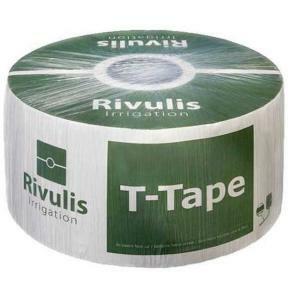 T-Tape, by Rivulis, is one of the most trusted names in drip tape worldwide. Using T-Tape drip tape reduces water consumption, increases crop quality and crop yields. T-Tape drip tape can be installed on the ground, under plastic, or even subsurface. Drip tape should always be installed with emitters facing upwards. T-Tape is available in a wide assortment of configurations, including various lengths, wall thicknesses, emitter spacings and flow rates to meet all your needs. Quality production standards, excellent material strength and reliable design make T-Tape the drip tape that you can count on year after year.